Your health requires personal attention! Welcome to Midtown Pharmacy, where your health truly matters! 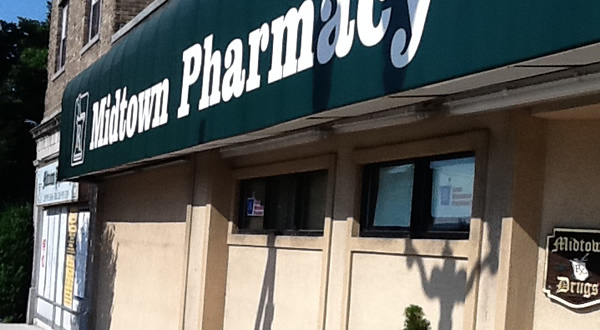 Our pharmacists and staff would like to welcome you to Midtown Pharmacy. Midtown Pharmacy has been in business for over half a century. We pride ourselves in providing excellent and courteous service to each and every one of our customers. We treat them all with the same care and respect as if they were our own family. You can call in prescription refills for pick up, or delivery. Our drivers will deliver your medications directly to your home or office if requested. We accept most prescription insurance plans, including Medicare, Medicaid, Horizon, Oxford, Aetna, Cigna, and many other private plans as well. Dr. Comfort branded diabetic footwear is now available through your Medicare insurance with a prescription from your medical doctor. We carry a wide selection of gifts, such as Yankee Candles, Burton + Burton, Glass Baron, and many more. Stop by at any time during store hours and please let any of our professional staff know how we can help you.